Hitwise vs comScore: Google Gains Or Losses, Yahoo Drops or Gains? 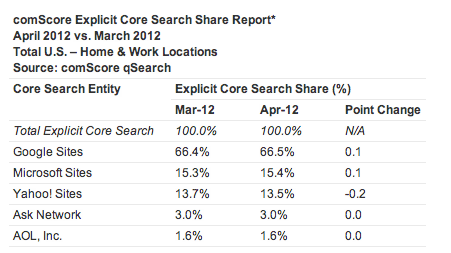 Hitwise released their April search market share report and comScore released theirs. Both sources say that Bing powers just about 30% search market share (between Microsoft and Yahoo properties together). Hitwise says Google dropped in market share, whereas comScore says they have grown. A WebmasterWorld thread, which is a very pro-Bing forum these days, talks about how Hitwise numbers are right.